The AB series of retrofit adjustable post bases provide a 1" standoff for the post, are slotted for adjustability and can be installed with nails, Strong-Drive® SD Connector screws or bolts (ABU). Depending on the application needs, these adjustable standoff post bases are designed for versatility, cost effectiveness and maximum uplift performance. See our Anchoring and Fastening Systems for Concrete and Masonry catalog for retrofit anchor options or reference technical bulletin Anchoring Solutions for Simpson Strong-Tie® Connectors in Wind and Low-Seismic Regions (T-ANCHORSPEC). Place the base, cut washer(s) or load transfer plate(s) and nut(s) on the anchor bolt(s). Make any necessary adjustments to post placement and tighten the nut securely on the anchor bolt. A flier featuring product information for post bases and caps that are tested and assigned load values specific for use with ArmorCoat XT Post from Belco Forest Products. A sales sheet featuring a SKU list of Post Bases and Caps that have been tested and assigned load values for use with Woodtone RealPost columns. Simpson Strong-Tie ZMAX-coated post bases (including Outdoor Accents®) may be installed with stainless-steel Titen HD screw anchors. Downloads may not be increased for short-term loading. Specifier is to design concrete and anchorage for uplift capacity. ABU products may be installed with either bolts or nails (not both) to achieve table loads. ABU88Z, ABU88RZ, ABU1010Z, ABU1010RZ, and ABU1212Z/RZ may be installed with (8) 1/4" x 3" Strong-Drive® SDS Heavy-Duty Connector screws (sold separately) for the same table load. For higher downloads, pack grout solid under 1" standoff plate before installation. Base download on column or concrete, according to the code. HB dimension is the distance from the bottom of the post up to the first bolt hole. Structural composite lumber columns have sides that show either the wide face or the edges of the lumber strands/veneers. For SCL columns, the fasteners for these products should always be installed in the wide face. Downloads shall be reduced where limited by capacity of the post. Beam depth must be a minimum of 7". Shims are required for double 2x and triple 2x installations as shown in the illustrations. Additional fastening of shim to beam is not required. ABA See specific model numbers for code listings. ABA44RZ No evaluation report listing. ABA66RZ No evaluation report listing. ABU1010RZ No evaluation report listing. ABU1010Z No evaluation report listing. ABU1212RZ No evaluation report listing. ABU1212Z No evaluation report listing. ABU46RZ No evaluation report listing. ABU5-5 No evaluation report listing. ABU5-6 No evaluation report listing. ABU66RZ No evaluation report listing. 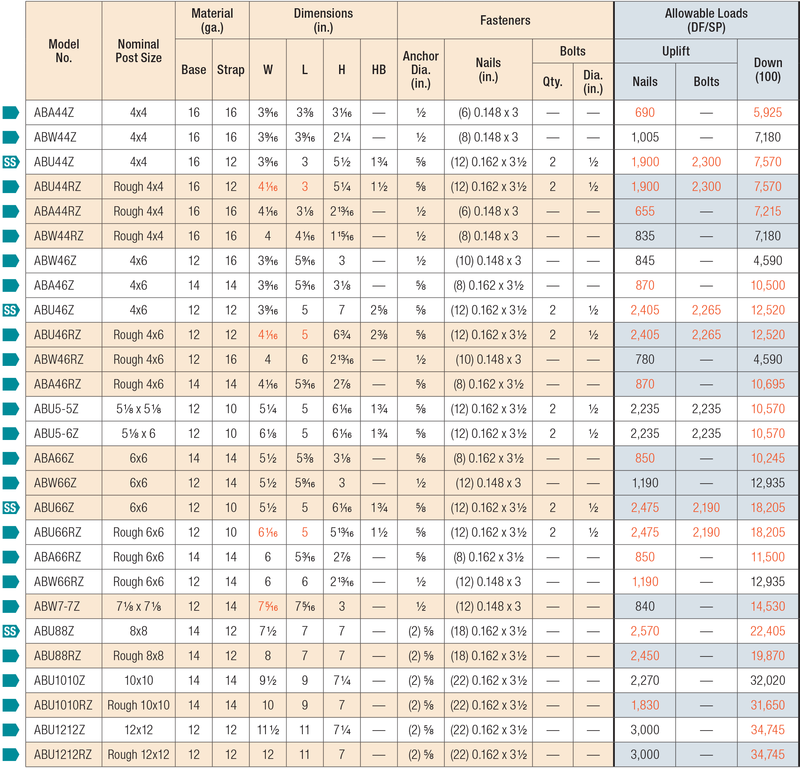 ABU88Z No evaluation report listing. ABW7-7Z No evaluation report listing.